Spring has sprung in California – as well as most of the country. To me that means spring vegetable season; asparagus, leeks, peas, artichoke, fennel and fresh herbs are bountiful in farmers markets. Much of this produce is available year-round, but spring is the best time to get the freshest spring vegetables, whether at your local market, grocery store or from your own garden! 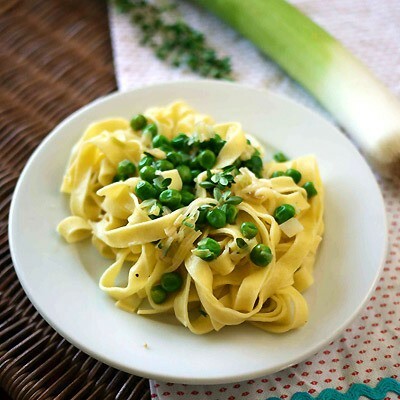 And those fresh spring flavors really come through in this easy spring pasta recipe, Fettuccine with Peas, Leeks & Thyme. It’s a cinch to make and it’s packed with flavor and nutrients, plus spring is a great time to get hooked on the Mediterranean way of eating. Adding a bit of the pasta water instead of using sauce is a traditional way to make pasta dishes in Italy. This recipe is a sure way to eat more vegetables and wow your friends with your culinary savvy! Italian wines can be hard to find, other than the super popular Pinot Grigio. If you can find a Soave wine, it’s a soft, fruity, clean wine with crisp lemon flavors and really complements this dish. Grenache Blanc with its acidity and rounded flavors, or Sauvignon Blanc with its herbaceousness, would also be great wines with this pasta. PREPARE pasta according to package directions, reserving ½ cup cooking water. While pasta is cooking, prepare leek mixture. HEAT oil in large skillet over medium-high heat. Add leek; cook, stirring frequently, until softened and golden. Stir in peas; cook for 1 minute or until heated through. Season with salt and pepper, as shown above. ADD reserved pasta cooking water, thyme leaves and cheese; stir in gently. Toss pasta with leek mixture. Season with salt and pepper.